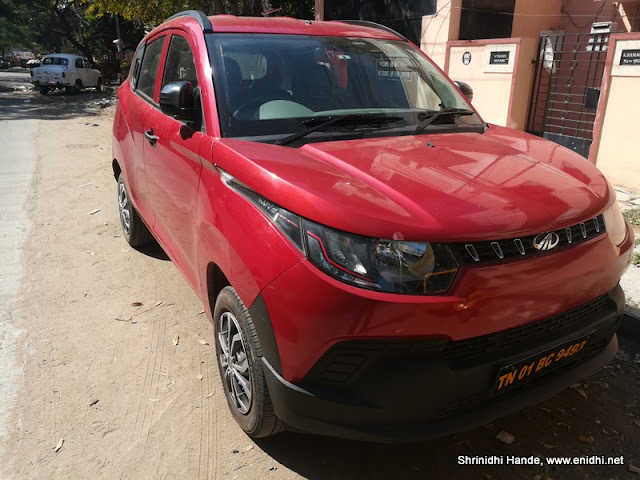 Mahindra’s KUV100 is a cute little car that has an SUV appeal and is targeted at those who can’t afford buy a 10-12 lakh+ SUV but want a SUV like vehicle. KUV100 has a price tag ranging between 6 to 9 lakhs on road (approx)[Details]. I had done a short showroom test drive of this car years ago. Recently a slightly refined NXT version is launched. Last weekend I rented KUV100 from Zoomcar and drove around for about 100 kms. This was the cheapest K2+ Diesel variant. 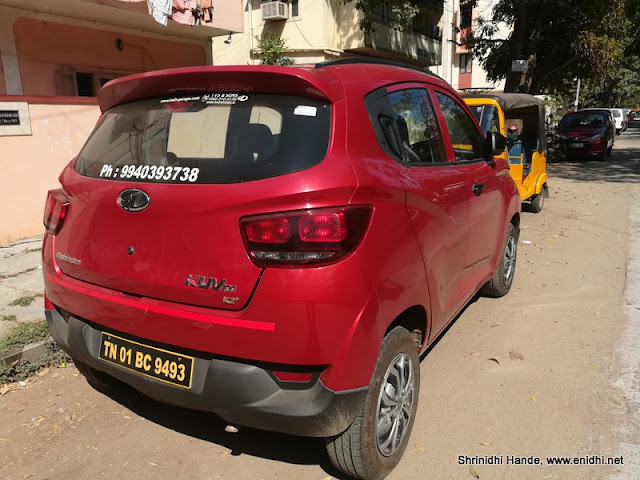 I felt the car warrants another review – hence this post, based on my 100 kms, 1 day experience in the rented Mahindra KUV1OO, which had about 25000 kms on the odo. 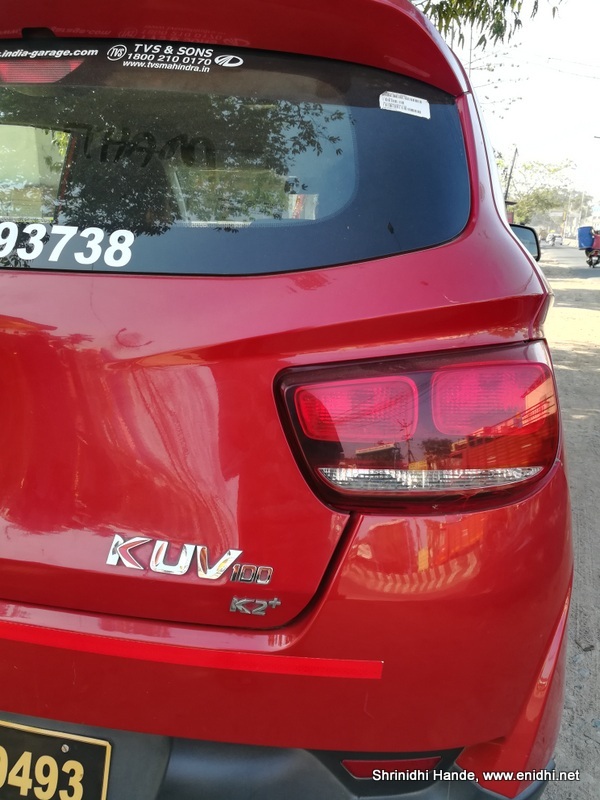 KUV100’s primary strength is its looks. From the outside, car looks inviting- high stance with a tall body and bumper, carefully crafted curves make it look bigger and SUV like. 170 mm ground clearance is at par with many other cars but at first look feels a lot. Nice headlamp assembly and front grill invite customers to consider this car than the competition. I don’t have any complaints on the exterior looks. Very well done by Mahindra. One small quick is the door handle design for rear door- slightly inconvenient position- this design is somehow adopted in many cars- Chevy Beat, New Maruti Swift etc- this design saves some cost for manufacturer but I find it bit inconveniently positioned- to twist your fist and try to open the door, compared to traditional position of door handle. But it is just my personal opinion. The new 2018 NXT version gets more padding and slightly refreshed looks. One I drove was the K2+ variant, which is cheapest version K2 plus an airbag. It doesn’t get anything worth mentioning. No power windows, no airbags, no parking sensors, no central locking nothing. Owner of the car had added remote locking as an extra aftermarket fitting and an old fashioned stereo. Instrument cluster shows current gear, but doesn't show distance to empty, temperature, average fuel economy and such information pretty standard in current day cars. 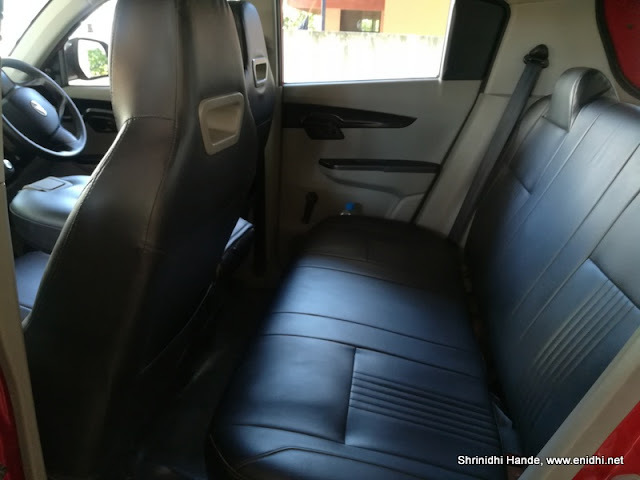 One of the unique features of KUV100 is its missing central column and an extended middle seat in first row. This extra space can be used to seat a small kid (without the safety of a proper 3 point seatbelt though)- if you don’t want this you can go for 5 seat option. The gear lever is moved up on to the dash. Not much of a problem. Driver will get used to it within sometime. 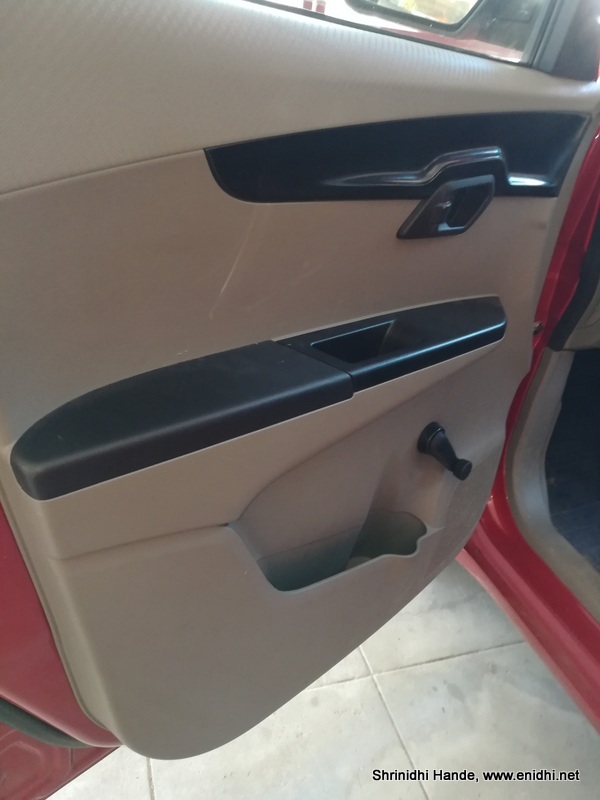 But the hand brake is of different design compared to regular cars- needs to be pulled and twisted to engage, pull further, rotate and push back for release. (Tavera has similar hand brake). Interiors are fine. KUV100 is tall, boxy and fairly spacious at par with most of the small cars. 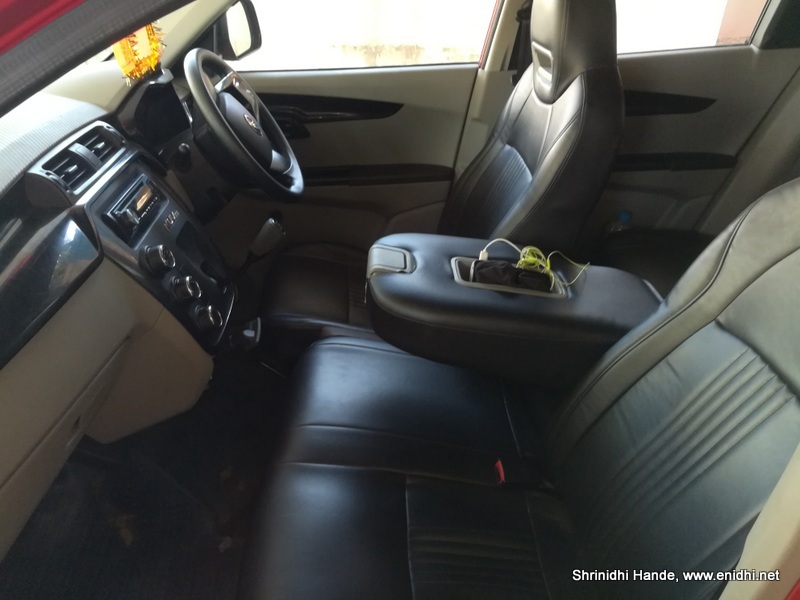 While head room is generous, KUV is still a small car, as far as leg room is considered. KUV100’s dimensions are few mm larger than most small cars in 5 to 7 lakh range but KUV is much smaller and less spacious if compared to proper compact SUVs like Ecosport or Nexon. KUV100’s biggest weakness is its engine. The 1.2 litre, 3 pot engine doesn’t have lots of muscle to support the SUV looks of the car. The rental car was fitted with speed governor that limits the speed to 80 kmph. May be this contributed to my opinion.The KUV I was driving had only some 25000 kms on the odometer and its dials started acting bizarre when I was running 3/4th AC. Watch short video below [or watch on Youtube]. I think I got an approximate fuel efficiency of 14.3 kmpl for the diesel. (Not a precise calculation- display dropped by 2 bars or 20% for the 100 kms I drove- 25% of 35 litre tank s about 7 litres. At this rate, KUV can have a range of about 500 kms before running dry. 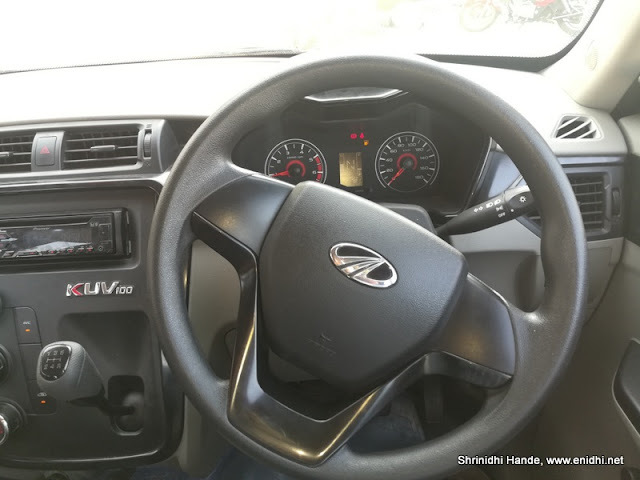 There is a new NXT version in the market now, which has some minor design and interior improvements over the older KUV100. But Engine and core mechanics remain the same as earlier. In the price bracket of 6 to 9 lakhs on road I don’t know if KUV100 is a great choice. For the on road price of K2- the cheapest variant, you will get top end variant of Tata Tiago. There're lots of premium hatchbacks and compact sedans in this price range with proven engines and more features. KUV has good looks, more utilitarian value (6 seats) and lots of headroom. But do cross check on the engine performance, reliability and maintenance aspects from some existing owners before making purchase decision.